Who said you can't have bluetooth with your YSI® 6 series sondes? Now the Y-HUB provides you with bluetooth connectivity to all YSI® 6 series units in the field without interruption of your SDI-12 data. Who said the YSI® 650 MDS® can’t have bluetooth? The Y-HUB comes with the 650BT module that can attach to any existing 650 MDS® display and provides bluetooth connectivity to all YSI® 6 series sondes via the Y-HUB bluetooth. Once on site, you can access the field sonde data via the available port on the Y-HUB or via bluetooth without any SDI-12 interruption or disconnection. The Y-HUB LEDs allow the end user to determine the source of any power failure. The Y-HUB includes power management circuitry that allows auto switching power, regulated power, and current spike protection for sonde and internal Y-HUB circuitry. Size: 150.6 mm x 127 mm x 63.5 mm. Total with connectors: 184 mm x 140 mm x 63.5 mm. Q: Can I use the 650BT module with any 650 MDS® display? A; Yes. No need for hardware or software updates. Just connect the 650BT module to the 650 MDS®. Q: Does the 650BT module require a battery? A: No. The 650BT module gets power from the 650 MDS® display. Just make sure the “Power to sonde” option is enabled. Q: Do I have to disconnect the 650BT module from the 650 MDS® display when not in use? A: No. The 650BT module goes off as soon as you power down the 650 MDS® display. Q: Can I connect my NX10 to the Y-HUB via a cable and bluetooth at the same time? A: No, Once the 650 MDS® or NX10 is connected to the Y-HUB display port via a cable, the bluetooth on the Y-HUB is temporarily disabled. Q. Can I connect the NX10 universal hand held to the Y-HUB via bluetooth and still run another multiprobe on the NX10 at the same time? A. Yes. The NX10 provides one connection to any multiprobe via RS232 and as many bluetooth devices as you want at the same time. Q: What happens when the SDI-12 datalogger turns ON while I am connected to the Y-HUB via cable or bluetooth? A: The Y-HUB will always allow the SDI-12 data to pass through first. During that time the connection to the bluetooth or cable connection are temporarily halted. 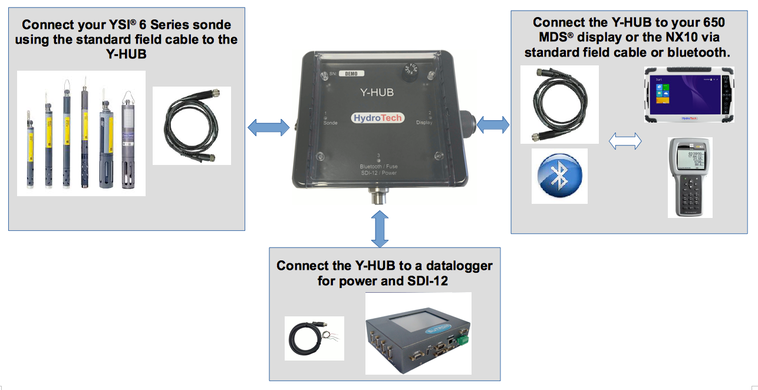 The bluetooth and the cable connection to the Y-HUB will automatically resume as soon as the SDI-12 data is transmitted to the datalogger.